Is it necessary to test on animals? If they don’t test on animals, what should/do they test on? Animal testing is animal cruelty. Often when you buy products you don’t even think about the animal testing behind it. When you buy household products, beauty products, medication there is most often animal testing done on either the different chemicals in the product or the complete product. Not to mention the countless amount of animals used in science experiments to test different theories, how the body or cells work, how different foods or diet works and the list goes on. At times it can feel overwhelming to read all the articles and experiments where animals have been used and the different treatments they have undergone just for the name of science and to try to prove a theory. I have written about animal testing HERE, which you can read more about. And here i will try to summarize what methods can be used instead of animals when testing products. 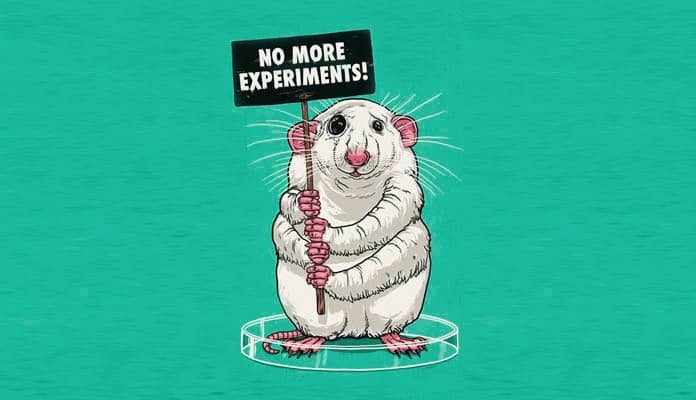 Animal testing has been deemed as more “Humane” and that it is wrong to test on animals… however it also makes me question, why is it ok for the different experiments to be done on animals who can’t protest or say no, but not ok to do on humans? Why is the life of animals not deemed as equal to that of humans… not to mention that just because a certain ingredient or chemical is ok for animals doesn’t mean it will have the same effect on humans. Luckily many scientists are forward thinking and more people are realising how animal testing isn’t ok and that we should figure out more humane ways to test and ways that don’t involve animals. Almost all medicine is tested on animals and this is for safety reasons, which i can understand. And of course, you shouldn’t stop taking medicine just because it may not be vegan… a sick vegan can’t do as good as a healthy vegan. So take your medication… but maybe don’t over consume pain killers just because you can and instead only when you really need to… both for health reasons and for the sake of the animals. You can read more about Is my medication vegan HERE and some animal free medication HERE as well as the campaign, make more medicines vegan. Today—because experiments on animals are cruel, expensive, and generally inapplicable to humans—the world’s most forward-thinking scientists have moved on to develop and use methods for studying diseases and testing products that replace animals and are actually relevant to human health. These modern methods include sophisticated tests using human cells and tissues (also known as in vitro methods), advanced computer-modeling techniques (often referred to as in silico models), and studies with human volunteers. These and other non-animal methods are not hindered by species differences that make applying animal test results to humans difficult or impossible, and they usually take less time and money to complete. If you are interested in medicines and vaccines and animal tests you can read HERE. For now it seems that medication is more necessary to test on animals compared to household and beauty products. However the question of “is it ethically ok” is being raised and also about how many studies are being done i.e how many times do you need to test the same pill and how many medications do we really need. My belief is that it is wrong to test on animals and when it comes to beauty and household products i do my best to buy CF and vegan products, even if i have messed up at times. But i plan to make a list of some non vegan ingredients which you can keep an eye out both in food and a list for beauty products. I am still learning so it may take a while for me to make that list! And with medication – take it if you need it, that doesn’t make you a worse vegan. But don’t take medication unnecessarily! And in the future lets hope that animal testing is no longer required and instead we can all be safe and healthy without having to test ingredients, chemicals and products on animals!!! I have a beagle, and often beagles are used in laboratories and used in tests because they are so obedient, so it breaks my heart to know so many beagles are locked up in laboratories and being experimented on. Previous Post Are you eating what you want to eat or what Instagram wants to see? The fact that there are still plenty of companies testing on animals makes me so sad. But it is reassuring to read that scientists are beginning to derive newere more modern methods of testing a product that does not involve animals. I hope this becomes the norm in the future. The poor animals have no say in whether they want to be used in experiments or not and this is so very sad. More awareness should be made of which companies do test on animals and those who do not – I for one had no idea that a lot of the “natural” skin care products were tested on animals – I just presumed they were not because they are marketed as without perfume, kind to skin etc etc, so I kind of thought they were indeed “natural”. I am going to pay more attention to the products I buy in the future. Pingback: 5 steps to a more vegan lifestyle – Post series.